I am having a BLAST playing with Laurie Wisbrun's new "Nesting Chairs" fabric line, available via her Scarlet Fig Etsy shop. 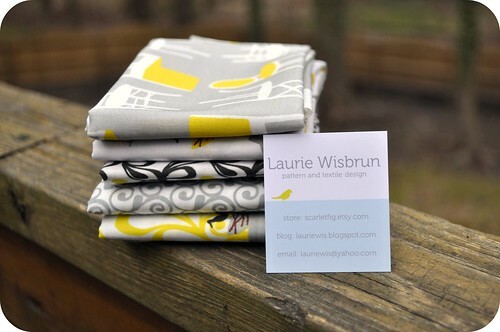 I've really enjoyed watching Laurie continue to put out limited release fabric collections via her Etsy shop ... in addition to her wildly successful lines for Robert Kaufman, like Tufted Tweets and Urban Circus. Besides Nesting Chairs, she's got some other great prints in her Etsy shop -- check out Polar Bear Dots, Modern Whimsy, and (of course!) Donkeys & Wellies. Whichever I decided not to use would be given away to a lucky reader of my blog! I had actually planned on using these grey and yellow prints, but went in the blue & orange direction once I pulled a couple of coordinates from my stash. These colors are amazing, though. Check out the pillow that Ashley made from this color story. So cute! 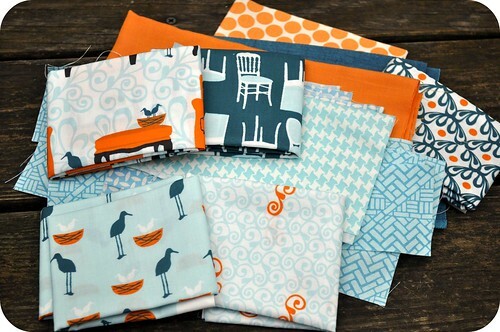 Want a chance to win this fat quarter bundle of Laurie's fabric? You know how I roll. All you have to do is leave me a single comment, and I'll let the random number generator pick the winner. Tell me what you'd make with these great prints, or simply say hello. I'll be picking a winner next Sunday, April 3rd. These fabrics are beautiful!! I would love to win this bundle...thanks for the opportunity! Wowza! What a fun lot of fabric! I've been looking at grey lately, and this would be fun to work into a tote bag, or maybe this needs to be my sewing machine cover...or both! Love it! Hello John - I love both color stories too and would have had a difficult time choosing! If I won, I would make a quilt for my sun porch. Beautiful fabrics! Off to look at the etsy shop. Thanks for the chance to win! Gorgeous fabric - haven't seen this before so would relish the opportunity to fondle it in person!! Thanks for the giveaway. I don't know what I would make but it would be something spectacular if this bundle is involved! I've been drooling over this for awhile and just haven't been able to pull the trigger because of the price tag. Thanks for the opportunity to win some, keeping my fingers crossed that I get picked! Thanks for the chance to win these great fabrics. I love them. Oooh! I've been looking at these for a while, and trying to make an excuse to buy more fabric. Thanks for the chance to win some. These fabrics are wonderful....my mind is reeling and thinking about what to make...so many ideas. Hi John, So i was reading your post thinking please give away the yellow, gray and black... ;)) Make it so.. Thanks for the chance to win. Mmmmm...this would really challenge me. As much as I like these prints...they are totally out of my comfort range. Challenge is good. Gah, these are so super cute! I think I'd have a hard time cutting into them, but I'm thinking some wonky log cabin blocks, a la you, would be awesome. Thanks for such a great giveaway! I love the colors of these FQs. I would love to make some pillows for the futon in my sewing room. LOVE Laurie's fabric lines. It's great having a chance to win a few of her goodies. Thanks! You should have picked the grey and yellow! They are definitely the more gorgeous of the two (though the blue and orange is SO NICE too). Can't wait to see what you've made. I would love to win these! Living on the bottom side of the world makes buying things on etsy etc cost prohibitive much of the time. those fabrics are awesome!! love both colorways - can't wait to see what you're making! I really like the blue/orange combination! I'd probably make a throw quilt for my little one. Thanks for the giveaway! These fabrics are fantastic! I don't mind leftovers! Thanks for a chance to win! i'm thinking they would make a great spring bag. Thanks for the chance! I would make my grandmother a fun set of mug rugs or snack mats. I am already finishing up her tufted tweets lap quilt. OMG, so pretty! Thanks for the giveaway! wow so awesome!! hope you pick me!! I love, love, love this fabric! I would probably make some pillows. ohhhhhhh, I am loving this fabric! It would make a wonderful summer quilt. Or, a tote. Or, pillows...gosh, I don't know. I just know that I would love to play with it. Those colors were made for me! Burp cloths or aprons come to mind. Those are so gorgeous! Pick me, pick me!! I would definitely incorporate it into a baby blanket for the new little baby on the way in the family I am a nanny for! Oh! I would make some cute pillows with that beautiful fabric. I love the colors! Wow, those fabrics are great! OMG I am obsessed with yellow and grey! I would so love to win this! My daughter would love the birds and the nests. I think I'd let her decide what I should make. I don't have a clue what I would make! Isn't that crazy!! I know that I would take some time to love them up, that is for sure!! Thanks for the give-away! Hello, John! What am I going to do with these fabrics? Add them to my stash, of course! I do like that yellow and gray combo. Thanks for counting me in. 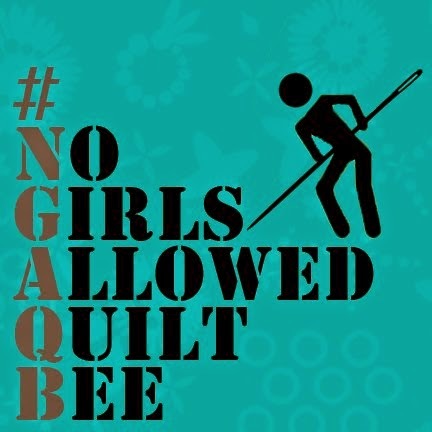 I'd make a quilt to hang on the wall in my sewing room! I adore the yellow - gray colorway. Thanks to you both for giving some away! these are awesome! i would make some deeply fabulous handbags with these fabrics! Hmm.. I just tried to post a comment and I think some sort of god of the internet ate it. Hopefully I don't wind up double posting... Anyway, I'd said that it was really lovely of Laurie to give you the fabric to giveaway. 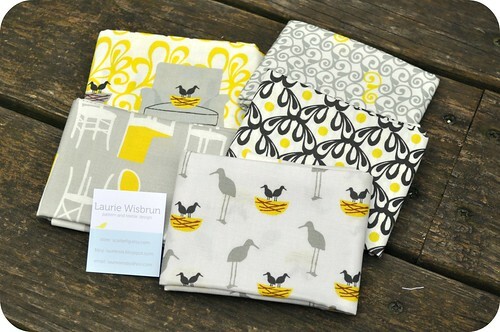 I love these fabrics and I would add them to my Laurie Wisbrun collection...! BTW-Loving my Patty Young F&F mug rug! can't bear to put anything potentially damaging on it, so it is resting under my antique silver hand mirror on top of the dresser....center stage :) Many Thanks!! I'd use them as contrast fabric to make the awesomest grocery bags ever. Love those nesting birds! What a charming collection! I can see why you had a hard time deciding. What a lovely collection of beautiful fabrics. Please enter me to win this grouping. such yummy yummy fabrics! loving the chair print. thanx for the chance! Can't miss this opportunity to win. I will may a quilted table runner for mothers day! I love these colors. I like making different sets of place mats and don't have those colors, they would look great! love the combinations. I think i would try and make some pillows for my bedroom. Thanks a bunch Quilt Dad!!! I like both colour-ways of this one. What a cute design! Both colorways are fantastic. I couldn't pick what I'd make with that fabric. I'd have to let it marinate for awhile before I could decide (and then I'd second and third guess myself until I finished the project). So pretty! I'd love to win! I don't know what I would make yet. But I love the fabric! Thanks for the chance! While I'm not sure what I'd actually do with the fabrics right now, I'm sure the right project would come along if I were to win. I love these colors and I love her designs. So cute! I would love to make a purse or skirt with this fabric. Thanks for the giveaway. I'm glad you went with the orange because I love the yellow!! Thanks for the chance to win. Wow, I wouldn;t know which to choose either. Love both of them. I am not sure what I would do with them. Keep them close and look at them for a while... but cut them for sure. 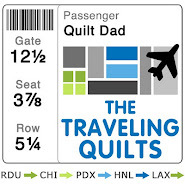 I'm actually trying to grab some of your flair for my blog, but don't see any html next to "Quilt Dad is My Homeboy". Hmmmm. Is there a glitch? thx! These fabrics are great! I've been wanting to make a grey and yellow quilt. Thanks for the chance to win! OOO.. I would love to make a charcoal and yellow quilt! Hello from soggy northern California - we have had a lot of rain lately. I'd love to win these fabrics. They would go right into a quilt. Thanks for the chance. Love the orange and teal color way. I've got a project going now with her Urban Circus - posting it at my blog this week - 4 days - 4 blocks. so cute! i'd use them to start a baby quilt for my friend who just shared the big news with me--the color is perfect, since we don't know the baby's gender yet. thanks for introducing me to this line! Beautiful fabrics. Love the birds! They'd go perfectly with the next quilt I'm planning! I like that gray and yellow color story. And the long-legged birds are quite cute. Those are just WAAAY too cute!! Love them! I see a baby quilt with those! They are awesome!!! Thanks for the giveaway!!! What a wonderful giveaway! Loving the grey and yellow color combo! Wow, super great giveaway! I love Laurie's fabric, and LOVE these colors! I've been wanting to make myself a grey and yellow quilt for my bed, this would be a perfect start...thanks! I love Laurie's fabric, and Nesting Chairs is no exception! Thanks for the chance to win! gorgeous fabrics! thank you for the chance to win. Lovely prints - they have pillows written all over them :) Thanks for the giveaway! Fantastic prints! Can't wait to see what you make! Thanks to you and Laurie for the giveaway! ohhhh I'm so glad you didn't use this one. I'm LOVING grey and yellow at the mo. Hello! both a pretty fabrics, and so I went and looked her up once I saw the little taste of fabric. Have fun sewing it up! I love grey and yellow color combo. What great fabric! thanks for the opportunity to win. Wow those fabrics are so great! I love the gray and yellow! What wonderful fabric. Thanks for the opportunity to win some. Those prints are LOVELY! I'd make a super huge pillow for my craft room. As a pregnant lady, I'm loving the super huge pillow, and then it would make a nice resting spot for my newborn once I'm no longer pregnant! Perfect! Please please please pick me Mr RNG! I love Laurie's fabrics! THanks for the great giveaway. That fabric is divine. I love both colour combos! And thanks for the link to Laurie's etsy store - found the perfect Polar Bear fabric to make a gift for a PB loving friend! I told the art teacher where i work that my favorite color is gray, and he looked at me like I was completely crazy. C'mon, what doesn't look fabulous with it?? Especially that yellow! Fab giveaway John! I'd make a tote bag for my sewing gear!! Wow what gorgeous fabric! I could certainly have fun with those. Thanks for the chance at the giveaway. tee hee hee. Ummm, I would LOVE to win these prints. I'm loving the yellow. Thanks for the give-away! I'd make a really cool baby quilt! They're lovely! Thanks for the chance to win this fabric bundle. If I win, I think this just might be the jumping point for a bedroom redo that desperately needs to be done. I love the mellow but cheerful feel of this fabric. wow this is so ooo generous! I so love these contemporary fabrics and looking forward with anticipation to see what you make with it! What gorgeous fabric! I am so loving grey at the moment! This is fantastic fabric! I am heading over to her etsy shop to (I'm sure) drool over everything else! How cool is that! Both colourways are soo pretty, but as autumn sets in, I'd go for the sunny yellow. So cute! I've been thinking of making some new pillows for my couch and those cheerful yellows would be perfect! Thanks for the chance to win a set! Oooh. Pick me! These are great. I'm not sure what I would make. I'm really into sewing clothes for my toddler right now. Maybe the bucket hat from Oliver & S Little Things to Sew. Since I'm renewing my love of sewing a pillow would be great for me. Have to start small you know! Love the yellows in this fabric line. Off to browse the other pillows and the etsy site. Thanks for the opportunity. Oh yes! What gorgeous stuff! I would dance a jig if I won these! Gorgeous prints! I'd love to win them and make myself a new spring bag!! Grey has become my (most recent!!) favorite colour, and with a number of friends pregnant right now, this seems like a perfect set of fabrics to whip up a cot quilt or two. Please random generator, pick me! Wow these are amazing - I would so love to win. Thanks for the giveaway. who knows what i'd make, so simply: hello! That fabric is so much fun! I think it would make the perfect beach quilt. Thanks for arranging the giveaway! I, too, love Laurie's fabrics and these are no exception! Thanks for a great giveaway! I think I would make a pillow also, but just saw the comment before mine and it would make a great beach quilt! Hello! When I saw the picture I thought I was at Oh Fransson. You and she have the same taste in fabric. Love the prints!! So pretty, John! LOVE the grey/yellow combination! At the moment I am making lap top sleeves, iPad cozies, etc. That is likely where these pretties would end up should they come to my house. Would love to win...I would love to make a purse out of this fabric! Love the fabric - looks like a baby quilt in the making to me! My eyes are green, I mean yellow and grey, with envy! I am a huge fan of the Tufted Tweets and this looks like a more sophisticated variation. This is so great! I haven't quilted for awhile and now that I'm back it seems like people are making really interesting fabric... beautiful stuff!! What great prints they are so awesome!! LOVE these fabrics. Laurie makes the coolest fabrics! I've never done the yellow/gray thing, but it's such a great combination. Tossing my hat (or my bobbin or something) in the ring! Go go magic random number! Boy I love this fabric and can't wait to see what you make! Love her fabric (how cute are those birds and nests?)! The fabrics look like a lot of fun...love the chairs and Laurie's fabric lines. Oh yes I DO want a chance to win! :) Pleeeeez! Put my name.. number into the RNG..
Gorgeous! I would make a quilt for our daughter due in May. Thanks so much for a chance to win!!! Oh my! I have been a big fan of Laurie's since she won one of the Spoonflower competitions over a year ago, and lovelovelove this new line! Thanks for the generosity! Those are so neat! Love the color combo! I'd love the chance to win such a pretty fabric bundle! LOVE these fabrics! Thanks for such a great giveaway!! I don't know how you choose between those 2 amazing color ways :) The grey and yellow is fabulous and I would certainly love to give it a new home. Love the grey and yellow color combination! It woud make a fun little summer quilt! Thanks for the giveaway! Hi! I think this would be the excuse I need to finally start quilting! love these. definitely a small quilt is in order. I just bought greys and yellows to make a quilt top. This would fit in nicely. Thank you! They are all truly beautiful! I would either make doll bed quilts for my daughters or skirts for them both. Whaaat! Somebody's going to be a lucky ducky! How sweet would this be for placemats and napkins. Thanks for the chance. My daughter would love these fabrics for her yellow, black and grey bedroom. Definately something like placemats to brighten up my kitchen. Thanks very much. Oh, I love these! They are beautiful. I hope I win! Nice fabric! Not sure what my main project would be, but the scraps would definitely find their way into a mug rug or two, courtesy of the inspirational post from Friday. Love the birds. They might make cute pendants or pins. I would love to win this bundle...thanks for the opportunity! Robert, in northern Iowa. What a great fabric collection! I think that little chair print is the cutest thing ever! I would love to win this! i love the color scheme. These are beautiful! Thanks for sharing with us - can't wait to see what you make with your bundle! I'm not sure what I would make, but I love these prints! A big beach bag, maybe? Thanks for sharing, and I look forward to seeing what you make with the orange/blue set. adorable! I think they would go into an awesome baby quilt - I have many friends expecting right now! Wonderful -- can't wait to see what you make with yours! I rarely know off the bat what I would do with a fabric line -- it has to spend some time in a pretty stack while the ideas roll around in my subconscious! I LOVE Laurie's prints! They're just so fantastic. Thanks for the opportunity! Oh those are so beautiful! I'm on a bit aid a fabric ban as we're moving in a couple of months, but I'm sure I could sneak them in if I won! thanks for linking to my pillow John! Love these fabrics, and very much looking forward to seeing what you make with the aqua and orange colorway!! Super cute fabrics. I'm excited to see what you do with them. Love the yellow with the grey. Thanks for the giveaway. When I buy a house, I am going to do up the kitchen in a white-yellow-dark gray theme. It would just be meant to be if I were to win this cool fabric! I can't wait to see what you create with that orange and blue fabric. LOVE LOVE LOVE! Such great fabrics! Thanks for the giveaway! LOVE the color combination! I would make a table runner with matching pillow! Golly, I'd make some pillows for my living room, but I'd reintroduce some orange For a bigger pop. Great fabrics. Those are so pretty! We just got some gray and yellow fabric for my daughter and I was jealous, so maybe I'll get some for me now! very cute! would love to see some in person.